We’ve submitted an update to the Swagbucks Newtab extension for the Google Chrome web browser. Which you can download and is available to from the Google Chrome Web Store. Fixed a bug which could cause Chrome to lag a few seconds on Window 8.1 and Windows 10 Developer Build. If you find any bugs in this release as per usual please report them via the official system support emails for bugs will simply be ignored, sorry about that. This entry was posted in Chrome Extensions, Google Chrome and tagged browser, Bucks, Cash, Chrome, freebies, Google, Google Chrome, Money, Rewards, Swag, SwagBucks, Swagstakes, web, web browser on January 7, 2015 by JordanTBH Technologies. We’ve published a small update for the IP Address Tool for the Google Chrome web browser. Which is available to download from the Google Chrome Web Store. The IP Address Tool update is available right now for Windows and Mac at no charge on the Google Chrome Web Store worldwide. The IP Address Tool is currently available in the following languages – It will be available in other languages really soon. You can download now via the update from the Google Chrome Web Store. If you find any bugs in this release as per usual please report them via the official system support emails for bugs will simply be ignored, sorry. As always Chrome does a good job of updating your extensions automatically, but it checks for updates on its own schedule – around every two hours or if you relaunch Chrome. If you know that a new version of an extension is out but Chrome hasn’t updated it yet, here’s how to do it manually. ** Information is retrieved from www.ifconfig.me and will never be collected, saved or shared. © JordanTBH Technologies Software 2014, All Rights Reserved. This entry was posted in Chrome Extensions and tagged Chrome, Chrome Extension, Chrome Extensions, Chrome Store, Google, IP, IP Address, IP Address Tool, My IP, My IP for Chrome, omnibox, What's My IP on July 3, 2014 by JordanTBH Technologies. We’re always continuing to improve our products and services and today is no exception. 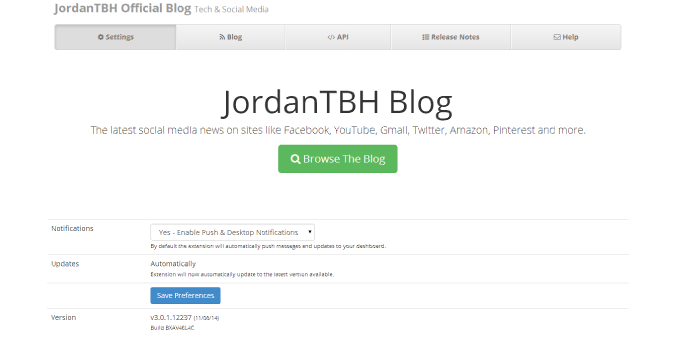 We just published an update to our JordanTBH Blog Extension which delivers a few bug fixes and improvements. We’ve added short name support. The short name is typically used where there is insufficient space to display the full name, such as the App launcher and the New Tab page. Fixed the ‘Chrome Extensions’ link in the footer which become broken due to the Download Hub revamp on the 09/6/14. You can download the extension via the Google Chrome Web Store as always it’s free. If you find any bugs in this update as always please report them via the official bug reporting site we would really appreciate it! Tip: Although Google Chrome does a good job of updating your extensions automatically, but it checks for updates on its own schedule – around every two hours or if you relaunch Chrome. If you know that a new version of an extension is out but Chrome hasn’t updated it yet, here’s how to do it manually. This entry was posted in Announcements & Information, Chrome Extensions and tagged Browser Extension, Browser Extensions, Chrome, Chrome Extensions, Extensions, Google Chrome webstore, JordanTBH Blog Extension, TBHDevelopers on June 11, 2014 by JordanTBH Technologies. If you recently visited our Download Hub website, you probably noticed the new design. We’re rather excited about the new design – and it comes with several improvements and features. The new design is much more modern and friendly. We added a content delivery network (CDN) with caching for faster, better loading! With this new website and design we’re aware you may run into a few bugs such as broken links from old posts and websites and our Chrome Extensions (these will be updated within the next few weeks). We’ve kept as many links as possible the same, but if you find any bugs please report them via the official bug tracking system. We love feedback from everyone! We will continue to make changes over the next couple of months we always take your feedback on board. Enough reading! Checkout the new design! This entry was posted in Announcements & Information and tagged Browser Extensions, Chrome, Chrome Extensions, code, design, downloads, extension, Extensions, free, freebies, Google Chrome, interface, new design, NotePad Plus, NotePad+, NotePadPlus, program, refresh, refreshed, Software on June 10, 2014 by JordanTBH Technologies.